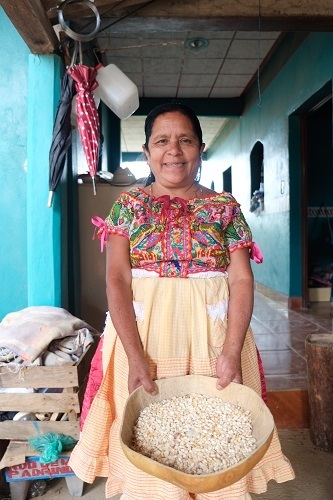 Felipa Martinez, an indigenous Mexican grandmother, grins as she shows off a bag bulging with maize cobs saved from last harvest season. 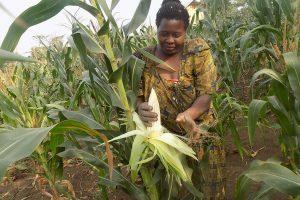 With her family, she managed to farm enough maize for the year despite the increasing pressure brought by climate change. Felipa’s grin shows satisfaction. Her main concern is her family, the healthy harvest lets her feed them without worry and sell the little left over to cover utilities. “When our crops produce a good harvest I am happy because we don’t have to spend our money on food. We can make our own tortillas and tostadas,” she said. Her family belongs to the Chatino indigenous community and lives in the small town of Santiago Yaitepec in humid southern Oaxaca. They are from one of eleven marginalized indigenous communities throughout the state involved in a participatory breeding project with the International Maize and Wheat Improvement (CIMMYT) to naturally improve the quality and preserve the biodiversity of native maize. These indigenous farmers are custodians of maize biodiversity, growing seeds passed down over generations. Their maize varieties represent a portion of the diversity of the 59 native Mexican races of maize, or landraces, which first developed from wild grasses at the hands of their ancestors. These different races (or types) of maize diversified through generations of selective breeding, adapting to the environment, climate and cultural needs of the different communities. Unprecedented droughts have hit Uganda’s farmers hard in recent years, affecting household income and food security by drastically cutting maize yields, a staple crop in the country. In 2016, at least 1.3 million people in Uganda faced hunger and urgently needed food aid after a dry spell decimated harvests, leaving some with less than one meal per day. When MLN, a maize disease with the ability to cause extreme or complete crop loss in maize, arrived in Uganda in 2013, farmers needed a variety that could cope. 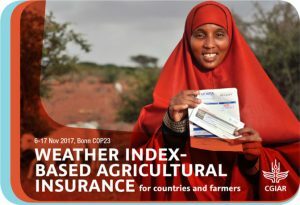 New insurance products geared towards smallholder farmers can help them recover their losses, and even encourage investment in climate-resilient innovations. What stands between a smallholder farmer and a bag of climate-adapted seeds? In many cases, it’s the hesitation to take a risk. Farmers may want to use improved varieties, invest in new tools, or diversify what they grow, but they need reassurance that their investments and hard work will not be squandered. 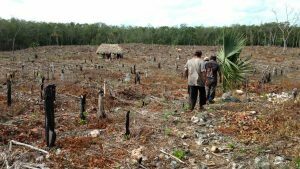 The Yucatan Peninsula in Mexico has been hard hit by drought and extreme weather events related to climate change in recent years, exacerbating local poverty and food insecurity. In addition, slash-and-burn agriculture techniques have led to environmental degradation and contribute to climate change. The International Maize and Wheat Improvement Center (CIMMYT) is working to help indigenous Mayan farming families in the Yucatan peninsula adapt to and mitigate climate change, increasing maize yields and food security while minimizing negative environmental impact. This comes as world leaders mull a crucial decision on agriculture at the UN Climate talks in Bonn, a decision that could support farmers everywhere to take similar actions.